We arrived at South Kawishiwi River Campground after a bumpy ride on curvy and hilly roads. 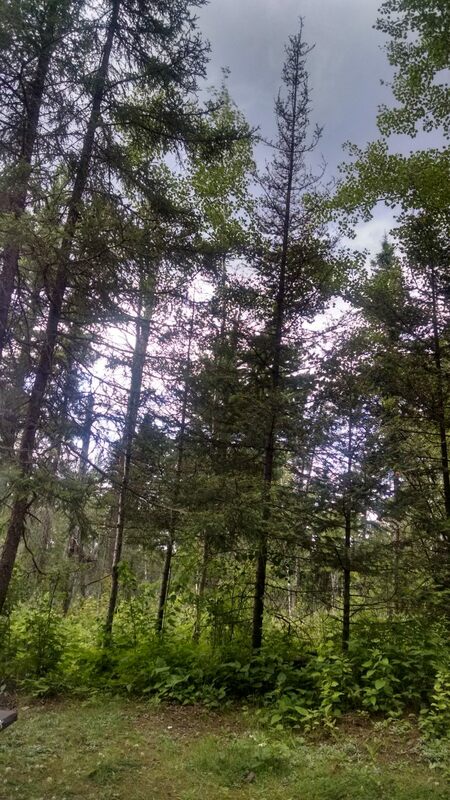 We chose this campground because it appeared on-line to be the most likely to have a site large enough for a rig our size in Superior National Forest. There were two available that would work for us, although there were plenty of sites that were large enough but that we would have possibly had difficulty accessing because the internal roadway was too narrow for the backup swing required to get into the site. There is another campground nearby at Birch Lake for smaller rigs with no hookups, but to get to it one must drive down a narrow dirt road inland for six miles. That will not work for us. We did a lot of research to come here. We came earlier than the family that we are meeting because we wanted to check out the place first to see if it would work for all of us. Once here and parked we scoped out an appropriate site for them and let them know to reserve it same day so not to miss the reservation window. They did and we are all set up for the weekend with them. Plans are to fish, canoe and visit the wolf an bear centers. This campground has streams flowing through the trails, a small lake with canoe rental options and a beach, and lots of wooded trees with private campsites. It has rained a lot and there is some standing water so the mosquitoes are healthy and large. We will take our future walks not at dusk, as one can get eaten alive! We were here a week and took the opportunity to catch up on general chores. Phil checked the seals on the rig, refinished a couple of wood stools that we prop our feet on when in our lawn chairs, and I did reorganization of drawers and closets. We did some outdoor cooking and generally relaxed for a week. We liked the small town of Ely. It is an outfitters location with many canoe tours, fishing trips and outback camping excursions packages. We went to town to do laundry and pick up fishing information and found a Farmer’s Market going on with a large crowd. Wow, we found wonderful vegetables and long lines for the reddest strawberries that I have ever seen. We walked away with some baked goods, the “world’s best bacon” and today’s fresh picked June berries, which grow in the wild. We will have pancakes with berries and bacon for breakfast one morning. We spent an afternoon at the International Wolf Center and became enlightened about the valuable ecological balance that wolves contribute. The wolf exhibits are lifelike and represent the hierarchy of the pack. The viewing gallery and program hall are expansive windows where speakers explain the postures and body language of each family member in the pack. There is a well-equipped theater room with videos and hour long movies telling the history of the center, various documentaries and reporting the different studies on wolves. Yes, Ely is a memory that we will talk about for some time. We are collecting wonderful memories!